After my nap I went to meet Tania, my Komsomolsk buddy from Couchsurfing. 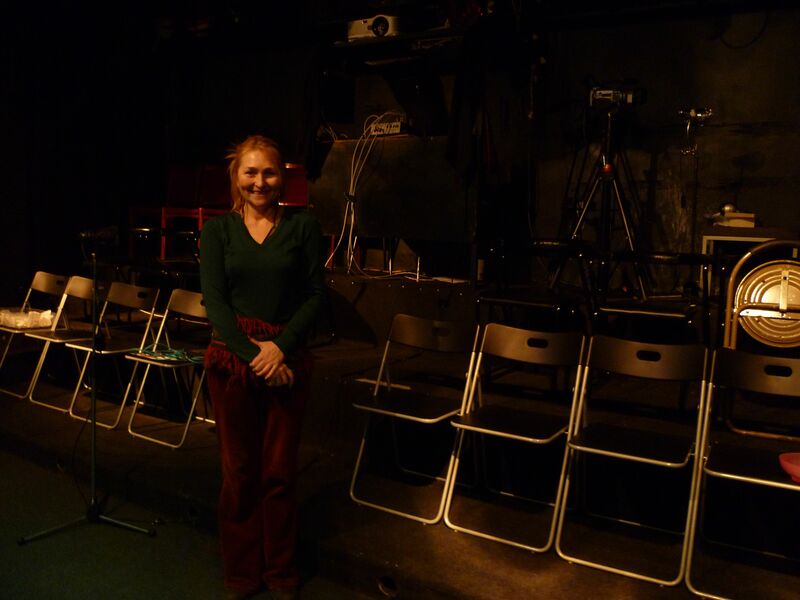 Tania runs a tiny independent theater called KnAM, which was founded in 1985. 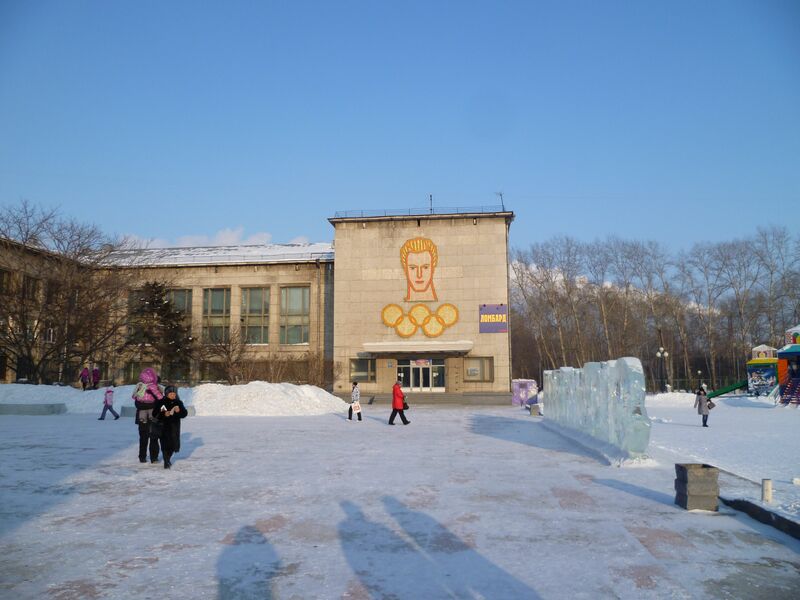 It was apparently the first independent theater in the Soviet Union. A labor of love for its founders, today the theater operates thanks to grants, donations, and the city administration. This is Tania in the theater, which has only 26 seats. 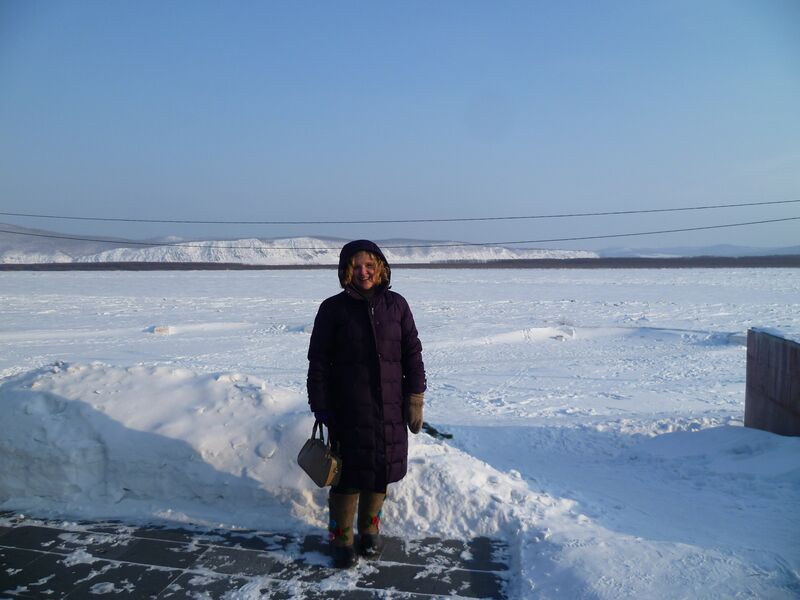 After about a bazillion cups of coffee, two other people associated with the theater, Volodya and Sergei, took me for a drive around Komsomolsk. After my brief walk to the theater in the freezing cold, I was happy to have a motorized view of the city. 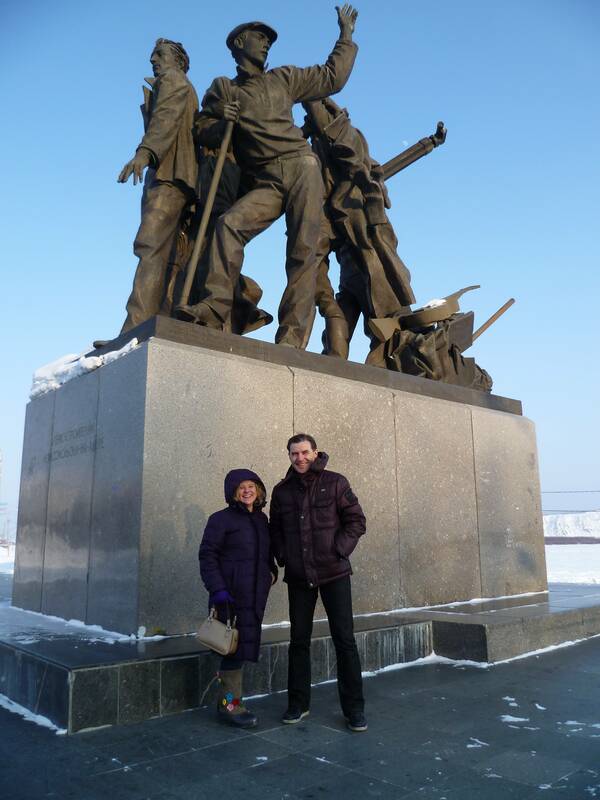 First we went to the monument of the builders of Komsomolsk. 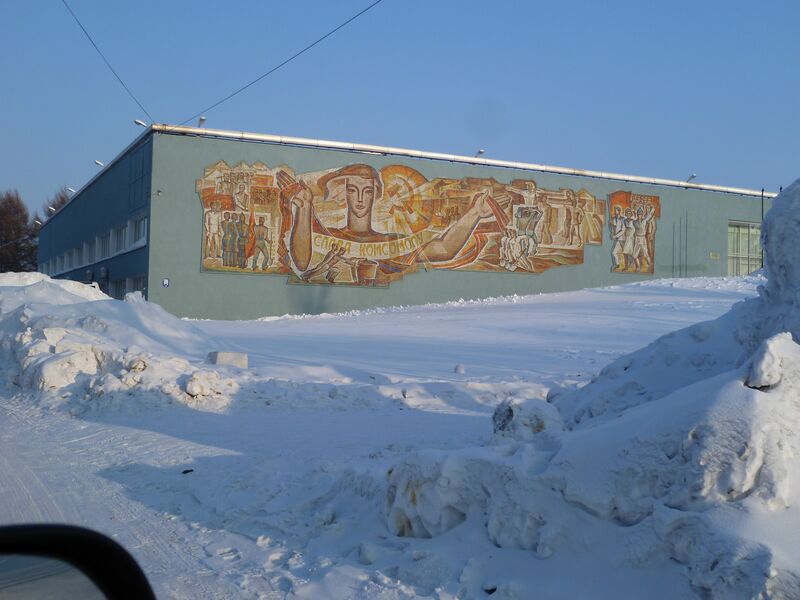 Komsomolsk just celebrated its 80th birthday; it is a very young city. Stalin sent the Komsomol (Communist Youth Organization) to the Far East to build the ideal Russian city: wide boulevards, good city planning, etc. 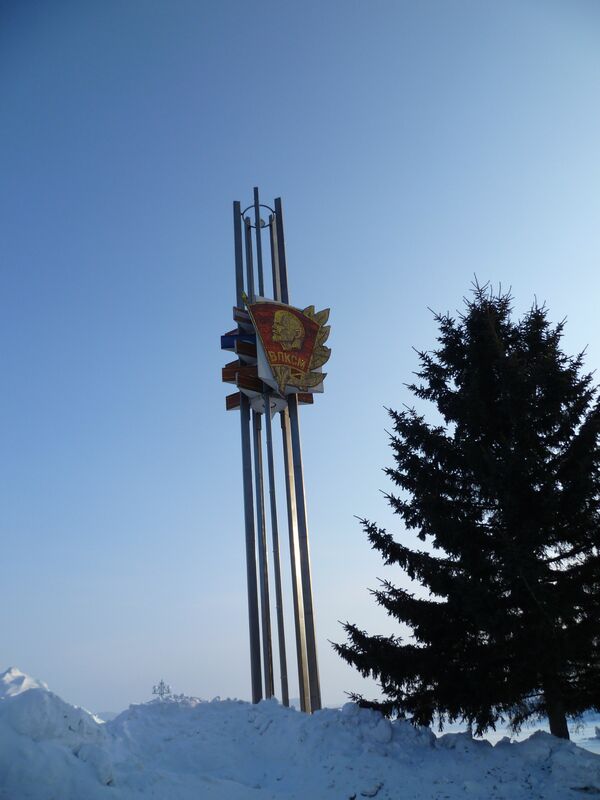 So the monument is to the hard-working members of the Komsomol who came here to carry out this massive project. That’s the story, anyway. The sad truth of the matter is that Komsomolsk was at first used primarily as a transit hub for the Gulag system. The city included seven camps from which prisoners were sent on to their final destinations: Kolyma, for example. The prisoners were both Japanese prisoners of war and victims of Stalinist repression, and it was primarily these people, the prisoners, who built Komsomolsk. Tania and her theater recently created a flash mob to memorialize the prisoners, to whom there is still no official monument. 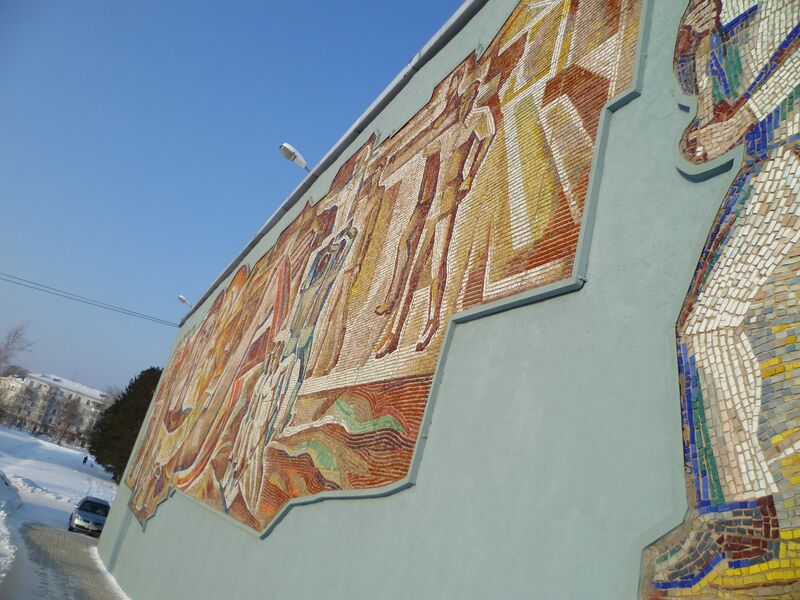 Komsomolsk is also the home of many Socialist Realist mosaic murals. 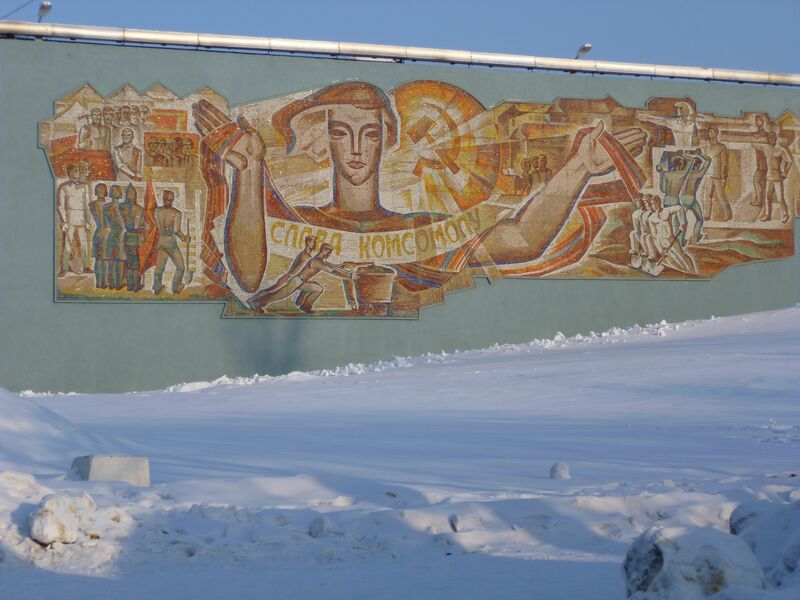 At first Sergey and Volodya were like, “Why the hell would you want to see that?” When you grow up with the murals I’m sure they seem like a bunch of Soviet BS. But as we drove around looking at them, even they admitted there was something to them.